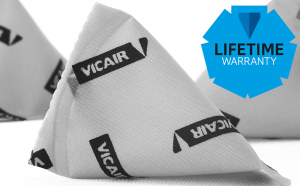 Lifetime Warranty applies to the new generation SmartCells only, recognisable by the black Vicair logo print (see picture on this page). Available from October 2017. In the case of a complaint about the SmartCells and/or to request replacement SmartCells, please contact your country’s distributor or contact Vicair directly. We can only provide you with replacement SmartCells under the condition that we receive the cushion’s serial number. We might also need extra information / photographs of the issue to complete the complaint registration. That is why you should never throw away damaged cells before your complaint has been registered by us. Inner & outer cushion covers are excluded from this Lifetime Warranty. SmartCells only. See General Terms & Conditions. Vicair Liberty cells are excluded from this Lifetime Warranty.